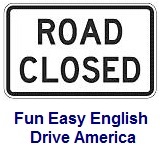 ﻿ Fun Easy English - Drive America - United States of America road signs, rules, and regulations warning, speed. Warning road signs for speed advisory and reduction are used to inform road users of a new speed limit ahead or to advise road users to reduce speed due to upcoming road changes. Warning road signs for the temporary traffic control of speed are used to inform road users of a new speed limit ahead or to advise road users to reduce speed due to upcoming road changes. Speed limit will be reduced to 45 miles per hour (mph) ahead. Speed limit will be reduced to 70 kilometers per hour (kmh) ahead. Speed limit is reduced to 35 miles per hour (mph) from this point. Speed limit is reduced to 60 kilometers per hour (kmh) from this point. Speed limit is reduced to 35 miles per hour (mph) on the ramp ahead. Speed limit is reduced to 60 kilometers per hour (kmh) on the ramp ahead. Speed limit is reduced to 25 miles per hour (mph) on the exit ahead. Speed limit is reduced to 40 kilometers per hour (kmh) on the exit ahead.